Eurus Energy America has recently expanded its renewable energy development in the United States to include solar projects. Please take a few minutes to learn more about our Avenal solar project under construction in California and to become more familiar with how solar power works by accessing the subheadings to the left. 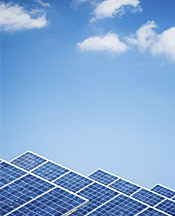 With more than 1,800 MW of renewable energy generation in operation worldwide and the construction of its Avenal solar project underway, Eurus Energy plans to continue to use its experience, capabilities and financial resources to develop, own and operate large-scale photovoltaic projects throughout America with a focus on the western and southwestern United States. Please revisit this section of our website periodically as we continue to release more information about Eurus Energy America’s solar development activities.